Black Diamond Canada Contest - Win a Hybrid Car! Home » Contests » Black Diamond Canada Contest – Win a Hybrid Car! Black Diamond Canada Contest – Win a Hybrid Car! 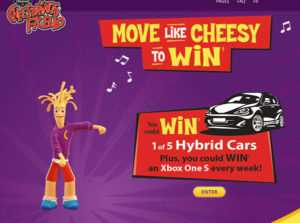 Enter Black Diamond Slices “Move Like Cheesy to Win” Contest for your chance to win 1 of 5 Hybrid Cars. Plus, you could win an Xbox One S every week with Forza Horizon 4 and 3 months of Xbox Game Pass! To enter the contest, you’ll need a unique PIN code and/or Secret Word. PIN codes and Secret Words can be found in specially marked packages of Black Diamond Cheestrings. No limit on the number of entries for the Grand Prize and/or Weekly Prizes using PIN code entries. Secret Words can also be found via their websites, social media pages and email blasts. Divine.ca: Win a deluxe prize pack from Folgers!